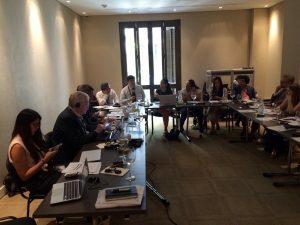 On October 3 and 4, 2016, the Auschwitz Institute for Peace and Reconciliation (AIPR) co-organized the First Dialogue for Latin American Parliamentarians, “Strengthening Strategies for Prevention”, alongside the Stanley Foundation, in Cartagena, Colombia. The activity, which involved the participation of the United Nations Office of the Special Advisor for the Prevention of Genocide, was conceived as an opportunity for reflection and the exchange of experiences and proposals on how to incorporate a prevention-centric approach into the work of participating parliamentarians. 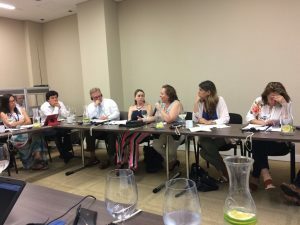 The event invited 6 Latin American legislators, accompanied by staff from their respective offices, to discuss the best collaborative strategies for the implementation of these approaches over the short, medium, and long term. These parliamentarians, representing Colombia, Ecuador, Guatemala, Paraguay, Peru, and Uruguay, also had the opportunity to learn about existing tools for prevention at the regional level as well as the chance to hear more about the challenges of the Latin American Network through an interactive dialogue conducted by a representative of the Colombia’s Ministry of Foreign Affairs, who serves as her country’s Focal Point in the Network. The Dialogue promoted the conception of individual initiatives that can be carried out by the legislators in attendance and fostered interest in collaboration and interaction between participants. Attending parliamentarians also worked to develop the proposal for a program of joint work aimed at identifying existing norms in each of the countries represented at the event and raising awareness of their utility as examples of best practices in human rights work with a focus on prevention. This experience and the active participation of the parliamentarians represents an inspiring challenge for AIPR, as we look to reinforce existing efforts for the prevention of genocide and mass atrocities through the incorporation of key actors within legislative bodies who play a role in the development and maintenance of mechanism for prevention at the national level.